Rays of light radiate through the clouds creating a beautiful sunset over Lake Eufaula. 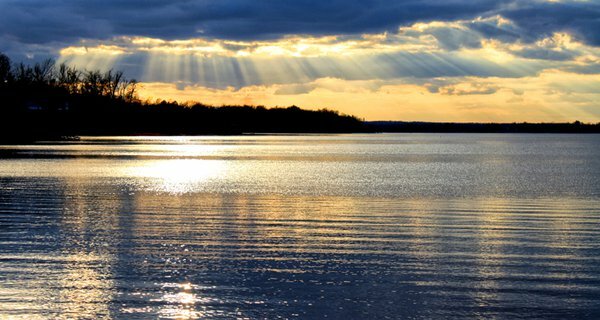 Spend an unforgettable day on the water at beautiful Lake Eufaula, Oklahoma’s largest lake. With more than 800 miles of shoreline, Lake Eufaula offers extraordinary opportunities for outdoor recreation like boating, skiing, swimming, fishing and more. It also boasts a variety of sandy swim beaches, towering cliffs and lush wooded areas, providing a stunning backdrop for your day on the water. Pitch your tent outdoors at Lake Eufaula State Park, kick back in luxury accommodations or rent an idyllic lake cabin during your trip. Serving as a gateway between northeastern and southeastern Oklahoma, the Lake Eufaula Area is brimming with things to do and is truly a sight to behold. No trip to the area is complete without a stop in the nearby town of Krebs, Oklahoma’s Little Italy. This small town boasts big flavors with beloved restaurants like Isle of Capri and Pete’s Place, where you can enjoy offerings from Choc Beer, one of Oklahoma’s oldest craft breweries. Be sure to stop by Lovera’s Italian Grocery on your way out and take home some of their famous homemade Italian summer sausage and browse the store’s huge variety of Italian cheeses, meats, olive oils, chocolates and more. With plenty of wide, wind-catching stretches of water, Oologah Lake is a great place to take a sailboat for a spin. This beauty of a lake offers a lot more than boating, though. It’s also a great place to take a hike. Hit the Will Rogers Country Centennial Trail on the east side of the lake, and explore 18 miles of trail stretching from the spillway through scenic Kite Hill and north to beautiful Blue Creek Park. Dive in at the swimming beach, go off-road with your mountain bike or hook up your RV at one of the park’s well-maintained sites. Oologah Lake is also a popular destination for hunters, with nearly 13,000 acres of land providing excellent hunting for quail, rabbit, deer and waterfowl. However you like to unwind, you can find it at Oologah Lake. From there, it’s a short drive to the Route 66 town of Claremore. You’ll definitely want to stop by the Will Rogers Memorial Museum, where you can learn all about the famous Claremore native by exploring 12 galleries of photographs, manuscripts and artwork pertaining to the entertainer’s extraordinary life and career. If you’re looking for a snack for the road, bounce over to the Route 66 Nut House where you can browse a variety of nuts, sweets and unique made-in-Oklahoma products inside a rustic log cabin made from real pecan logs. There is no shortage of ways to get your kicks in this charming small town located a short drive south of Oologah Lake. With shimmering bodies of water scattered throughout the region's gorgeous rolling hills, Green Country in northeastern Oklahoma is truly a lake lover's paradise. Located on the scenic Illinois River just a few miles south of Tahlequah, Lake Tenkiller is one of the most popular lakes in the region. The centerpiece of Lake Tenkiller State Park, Oklahoma’s “heaven in the hills,” this gorgeous area is truly a sight to behold. Swimmers can dive in at the beach and anglers can reel in various bass species, crappie, catfish, walleye and more. The park also offers 85 RV sites and 144 tent sites scattered between 10 campgrounds, including great opportunities for lakeside tent camping so you can get away from it all on the beautiful waters of Lake Tenkiller. If you’re looking for indoor lodging, kick back in a one, two or three-bedroom cabin and relax while enjoying the comforts of home. You’ll definitely want to check out the town of Tahlequah on your Tenkiller adventure. This quaint, historic town is bursting with charm, natural beauty and plenty of opportunities for fun. Drop in at the Cherokee Heritage Center, where you can learn about the history and heritage of the Cherokee people and tour the many displays scattered throughout the center’s 44 wooded acres, including the 1710 Cherokee Village focusing on Cherokee life before European contact. For lodging, grab a room at unique nearby properties like the Fin & Feather Resort and Blue Doors at Tenkiller in Gore. Come discover the unexpected during your getaway to stunning Lake Tenkiller. The rolling hills of eastern Oklahoma provide the perfect backdrop for a day on the water at beautiful Fort Gibson Lake. Take in the natural beauty of the area while you explore this 21,798-acre lake near Wagoner. Surrounded by the Fort Gibson Wildlife Management Area to the east and beautiful Sequoyah State Park to the west, a trip to Fort Gibson Lake is full of possibilities for outdoor fun. Whether you’re looking for some fishing therapy, a boating adventure or a leisurely swim, you’ll make memories that will last a lifetime on Fort Gibson Lake. Camp out under the stars, or stay the night at the Lodge at Sequoyah State Park, featuring 104 renovated guest rooms and 45 charming cottages. The nearby town of Wagoner offers plenty to love as well. Book a room at the charming and cozy Indian Lodge, featuring a stocked fishing pond and peaceful, wooded surroundings. If you just can’t get enough water-based fun, you can beat the heat with a trip to the Wagoner Water Park, offering fun waterslides and splash features along with a special children’s zone for the little ones. However you complete your trip to this gorgeous part of the state, you’ll be glad you made the trip to Fort Gibson Lake.